When two different images are presented to the two eyes at the corresponding retinal locations, observers often experience binocular rivalry - alternating perception of the two competing images. In a number of behavioral and neuroimaging experiments on binocular rivalry as well as using rivalry as a tool, we show that binocular rivalry primarily engages the Parvocellular pathway; object level information is available in the brain from the suppressed images; observers' spatial attention could be guided by certain types of invisible images; and that when attention was diverted away from the competing stimuli, binocular rivalry ceased and interocular competition remains unresolved. Sheng He obtained his PhD from the University of California at San Diego in 1995, and has been a Professor at the Department of Psychology University of Minnesota since 1997. He is currently the Director of the State Key Laboratory of Brain and Cognitive Sciences, Institute of Biophysics, Chinese Academy of Sciences. 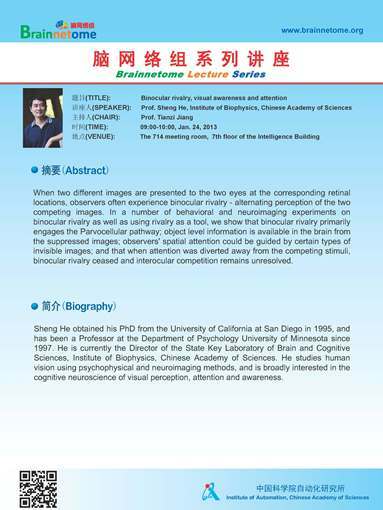 He studies human vision using psychophysical and neuroimaging methods, and is broadly interested in the cognitive neuroscience of visual perception, attention and awareness.